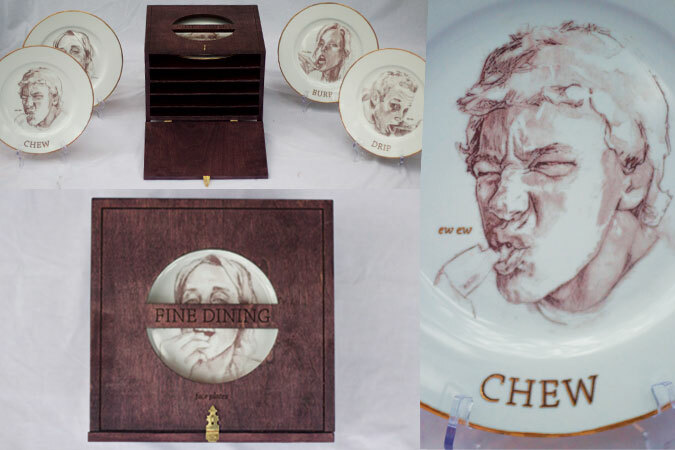 This series of porcelain plates explores on the faux pas of eating, elevating them through the materials used. Words hand lettered with gold luster, illustrations carefully rendered, and a laser cut box allow this somewhat undignified subject to be transformed into Fine Dining. The illustrations were applied to the porcelain through the use of laser decals, which where fired at a high temperature allowing the red iron oxide in the decals fused under the glaze of the plates.